In case you haven’t noticed yet, the hand drawn style is one of the hottest design trends. There are several ways to create hand drawn images — you can create it from scratch in Photoshop or you can scan an actual hand drawn sketch. Personally, I like to use a scanned drawing because you get a realistic drawing texture. Here is a quick tutorial to show you how to create a hand drawn design in Photoshop using the blending mode and alpha channel. 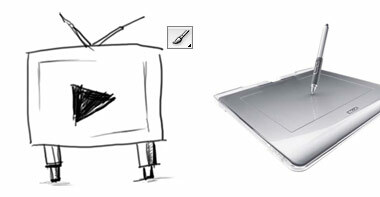 If you have a tablet, you can simply draw the sketch by using the brush tool. If you don’t have a tablet, you can create the artwork in Adobe Illustrator and then imitate a hand drawing effect in Photoshop. First draw a vector illustration. Then import it in Photoshop. Use a grungy brush and gently erase select parts of the image. Use the Blur tool to create the smug effect. 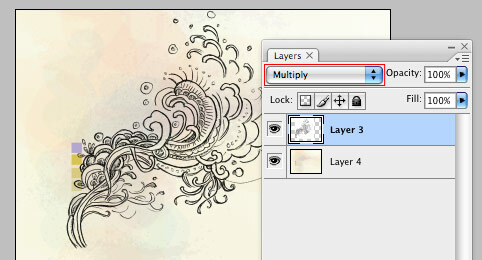 The easiest way — scan the drawing and set the layer blending mode to Multiply. If you want to have a white color stroke instead of black — go to menu Image > Adjustments > Invert (or press shortcut Cmd+i) and then select Screen blending mode. What if you want more than just a black or white stroke (ie. colors gradients)? Then you will have to extract the drawing from the white background. A simple way to do this is by using alpha channel. In the Channels palette, create a new channel. Then paste the drawing in the new channel. Invert (Cmd+i) the channel layer. Go back to the Layers palette, create a new layer. Go to menu Select > Load Selection. In the Load Selection prompt box, select Channel: "Alpha 1" (which is the name of the alpha channel I created earlier). Shortcut Tip: the shortcut for loading a channel selection is Cmd + Opt + any number key (ie. 1, 2, 3). 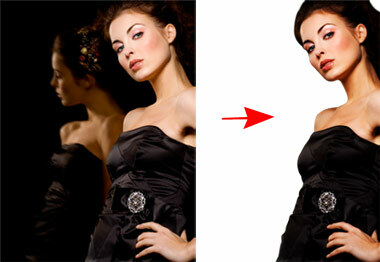 Learn more Photoshop shortcuts. With the channel selection loaded, you can fill it with any color. 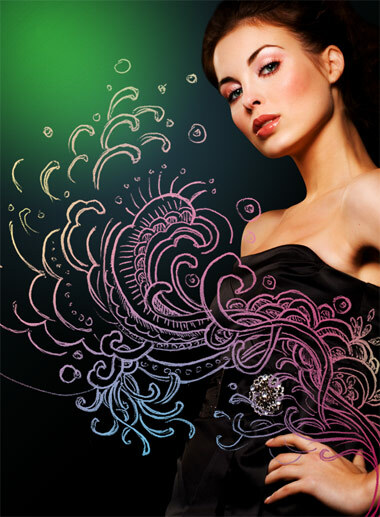 For the purpose of this tutorial, I’m going to show you how to incorporate your hand drawing on a female model (the photo was purchased from iStock). 1. First, cut out the model. 2. Fill the background with some sort of light glowing gradients. 3. Paste the drawing on top of the model. Lock the layer transparency. Play around with the color gradients. 4. Duplicate the drawing in the background to add more details to the image. Thanks for a very effective and easy-to-follow tutorial. It’s very considerate of you to include an option for people who don’t have a tablet – I do own one and I know how tough it can be to follow many tutorials online without it. Thank you! You’ve inspired me to add some hand drawn stuff to my site. Nick , put that wave and other things away , just show us a real girl . Awsome tutorial! how do you get such a great idea? It’s easy and beatiful, nice! Great tutorial. Thanks a lot for sharing. Again a great tutorial to learn from! Keep it up! great tutorial. i’m always in awe of people with really strong photoshop skills. i’ve been using the pen tablet technique for some time in order to get the school-style handwritten words on my site. it works well and is reasonably fast to implement. YES! very nice tutorial, i hope i get my tablet very soon to do this sort of art. and my blog needs a new design too. I have a wacom intuos A4 and i must say thats a great tablet! i dont be a master of drawing but for some little things it is perfekt! Of course, good tutorial, i like your stuff! Great for inspo when sketching!! That is pretty awesome I am going to try that out once I get a vector pad. I’ve used this technic many times… an other way to do something like that, is to draw it on paper and take a photograph by digitalcamera. In most cases the result is good enough for web or something like wallpapers. thanks a lot! great tutorial. Thanks, I’ve been looking for this for about 2 weeks now! 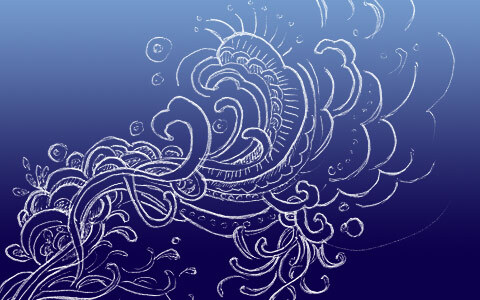 Cool tutorial yet again, I like the lineart effect on the swirls from the scan. Loving your tutorials and have such gratitude to you. But I’d like t ask if you can make a tutorial on how to cut out pics from Photoshop, I mean like what you did to the model. I always have a hard time doing it and maybe you have some tips & tricks to it. Thanks again for your lovely site. Thanks for the article, I love this sort of effect. cool stuff. As Ukrnet also said, the “digg” guy looks cool. Sweet! this will come in handy for my current blog redesign. I’ve recently made hand drawn design for my blog. Wow I’m in trend. This is one among the best designs which I have seen in the past few months. Good work. Carry on … friend. Great stuff! I just have one question, though. 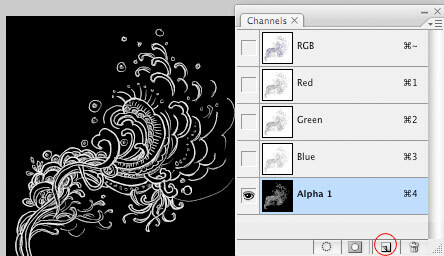 For the gradient part with the alpha channels tutorial, you say to first Copy (Cmd+C) the drawing. Do you mean to ctrl + click the layer thumb and copy the selection of drawing’s outline, or to copy the drawing after pressing ctrl + a (or something else)? I’m just trying to figure out exactly what I’m copying at this step. Thanks again for all of the tips! I love getting the chance to learn new Photoshop skills! I love the hand drawn stuff. Hopefully the trend persists. This is a seriously sweet little walk through. Love all the stuff here. Thanks for this tutorial, Nick. As always, awesome. so if I scan in drawings should I open them straight into photoshop or do i need to trace them in illustrator first…or does it matter? hey man, sweet tut, i saw a similar thing on Miami Ink, the guys took photos, and tattooed over them, very cool! I really love you Photoshop-art! Thank you so much for share it wiht us! every since you posted the 2008 design trends I’ve been looking for tut’s about “hand”drawn designing.. So thnx for the simple little tutorial. Awesome – I have been trying to get this whole effect for a long time! Something I did in Photoshop hat ya’ll should check out and vote for, I need money so I can go back to school and this is for a scholarship. By the way I love these tutorials this site and ndesign are how I learned how to use my fav programs. This tutorial is excellent! See more examples here. I am a non tablet user as well so this is going to benefit me substantially! 1st post here on this site and must say… just the layout of your site is what is bringing me back… it is so visually attractive and the flow is very well thought out..
guess what im buying tomorrow? Its simple, yet totally mindblowing! I’ll have to try that sometime soon. Do a lot of designers use tablets? I’ve heard a number of designers say that they prefer using a mouse. I never even really gave thought to scanning an image in. I’ll have to give it a try and see how it comes out. I see that you’re using hand drawing image as the background of this post, looks nice and very creative, thank you for sharing this useful tips. I am excited with the webdesignerwall. I learned lot of creativity and ideas. I am working as a webdesigner. This is really helpful for my present and future..
Looks great. Inspires me to get my tablet out. I still find it a bit daunting to use. oh my thats so nice. . . Thanks a lot. it so good for me to use in my work. This is really a great technique to create a great design! Cheers. I severely dig this site. I’ve mention your site on my last post on my blog. 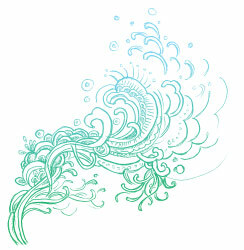 You mentioned that you can create a hand drawn design from scratch in Photoshop from scratch? I know it’s not your preferred method, but how would one go about doing so? Is there a certain brush that can be used? Please enlighten. Noce work however it could have been more eye catching and professional looking if a little emphasis was put on the use of harmonic colors. Thanks for the post. Get the idea behind (Don’t Have a Tablet? ), but am missing what the associated image is doing. Very excellent tutrial! It helped me a lot. Thanks! very nice work! very useful tips, as always! wow! it look sooo easy! i feel like trying it out!! I wanna say: you are really a Master. That was cool though its simple yet impressive.. thanks for sharing. Nice work!…Thanks for amazing tricks. Thank you for this tutorial Nick. Very useful tutorial. Thanks mate. Interesting effect. I’ll have to try that out some time. Cool idea. I love sketching and drawing and often find some things a lot easier to hand draw so I will definitely try this out some time. This is great stuff.. thanks for sharing! Love this tutorial, I’m going to an art college currently and they really don’t encourage this enough! It has been rumored a lot more of our fine arts students are being hired over the design students. This easily could be why! Great article, great ideas. As always! ill surely use these on my projects! Good article on hand drawn design process…Thanks! It’s a very nice tutorial. I will try it on the next days. Very impressive result and very easy to follow instructions! Very Nice, good to see a great PhotoShop tutorial! Creativity Have no limites…..Very Good Design. I can’t express your art with words . I can only say God Bless You . Nice one it’s great ti hear ..Keep it up..
sorry, aber einfach eine scharfe schnepfe nehmen und etwas gekritzel drüber? That is gorgeous. I’m definately going to be trying this out. I’ve been reading (and seeing) a lot of the illustrative style lately and its just amazing. I haven’t seen this type of website before, really different and artistic. I liked it. love your website. excellent art, tutorials, everything! i want to make a website to display some of my work, and i’d also like to help others with their graphics, a bit like you, but i have no idea how i can construct a website. i have a host, but i don’t know how to put my stuff on and how to put a layout and all that. if you could help me that would be great. Thanks…Great tutorial for web 2 sites. This is the greatest Ive seen on the web. First, thank you very much for the information. I’m just a beginner but having a load of fun! Second, your website is absolutely BEAUTIFUL! Thank you for your information, I’ll be coming here often! Amazing tricks for designers on this site… really prefect tutorials for web 2 sites. Muy bueno el efecto! me encanta tu blog!!!!! good work, but what the basic tutorial for me, someone who didnt know photoshop?what the first step i should do? nice tut. i like the more advanced stuff you offer (such as alpha channels) — i don’t always thing of doing that. Iam not profecional buy I would like to make a nice imagines to decorate face books and my lenguage is spanich and is to hard to explein to you thanks..
That was really helpful, surprisingly, I limited channels to one color, why? I don’t know why till now. Thank you! WOW! Very cool. Very useful! Its really useful. Keep on posting more…..
Nice little post – not being a truly skilled manual illustrator (i received the training but lack the patience), I’ve been especially fond of the quick sketch methods for a while now to incorporate with more lofty designs. It doesn’t work in all situations, but I’ve gotten some great results that I’m happy with – and the elements make for great additions to everything from wallpaper to little human touches on major corporate websites. Glad to see some stuff being written about this. very nice! i wish i could make my own hand drawing. i’ll try it! Thumbs up man! nice tutorial! thanks for this! I’ve noticed it really hot right now, especially on cartoon network. Can this be done in Illustrator? THIS IS AMAZING I LOVE IT!!! Envy, im not the best at hand work. Your website is extremely interesting and has kept me hooked for hours already. Another great article… Well done! your site looks cool. Its Awesome and I love it. Thanks for your great resources. Very Cool !!! Thank you for your suggestions!!! this is the link in your web site please take it off. the picture of me is still in your website why? I think what you should do is to send an email to the web master asking about your issues instead of posting comment here, because the comment is usually not going to be read in time. Nice tutorial, thank you! I can see using this one a lot. To Emily Liz: It seems your photographer sold this photo of you as “royalty free”. That means when a designer buys the image, they do not have to seek permission to use it. If you did not agree with your photographer for this, ask the photographer to remove your images from their sales listings, otherwise, you could find yourself on any ad for anything at all. I already spoke to the owner of this website and its OK know. Thanks everone. I hope you guys had a great Christmas. wow I wish I could draw that good, great tutorial. Thanks for taking the time to share this. Just found this site and will be returning frequently. Cheers! its so amazing to have this website for all the designers who used photoshops & illustrator… “very very very nice tricks” i love it. good job keep it up…..keep goin…!! I think the background /header of this website looks much more better than your examples in this tutorial. I would have cut out the model… but nice article. Thank you for your time and work in putting your tutorials together. I come here often and have learned quite a bit thanks to you! Cheers! I think your work is amazing- and it’s class getting an insight into how you do it -i am just starting out -trying out – and am even more inspired now -thanks. I do everything right, I select the “Alpha 1” … and then? the page is still black and the lines are still white :(( …and if I try to fill with a gradient it fills the entire page but the lines are still white.. This is a very good article..thanks! I would like to know if I have a tablet with a pen tool can you please let me know step by step how to draw this? Great tutorial. Thank you so much! Great and simple tutorial. I love incorporating hand drawn with digital design. WebsiteReckon contains a collection of useful features such as checking Google Page Rank (PR), Compete and Alexa Traffic Rank, Backlinks Checker, Server IP and Location on Google Map, DMOZ and Yahoo Directory Listings and more. You can use it for various purposes include doing research before buying or selling website; want to find out how popular the website is; use it as SEO analytic tool to improve your site performance; or just about curiosity. A brush head that is drawing some of this. love your design…your blog is my design inspiration and the tutorial is awesome…thanks. impeccable tutorial thank you for sharing!!!!!!!!!!!!!! if only i could draw! what a lesson, thanks! :) keep up the good work! WOW I so want to try the model design. I really appreciate your professional approach. Nice one. I will apply it for making good design. Thanks for the tips. White iphone 4 Conversion Kit is now the hottest iphone 4 piece that you should get! I’m also commenting to let you know of the excellent discovery my wife’s girl undergone going through your web site. She learned a wide variety of pieces, which include what it’s like to have an amazing giving mindset to get other people smoothly thoroughly grasp a number of very confusing things. You really did more than our expectations. I appreciate you for rendering the important, safe, explanatory not to mention unique tips about this topic to Mary. Vielen Dank für dieses Blog-es ist toll! Ich mag diese Art von Menschen, die Wissen mit anderen zu teilen. Nice informative collection, thanks for sharing. It’s looking so beautiful and good design of this image. Muchas Gracias for showing us. i use it my ecomerce sites banner.thanks for sharing, very nice. I love that page because is cool! how creade a new desin !!!!!!!!!!!!!!!!!!!!!! This is was such a great insightful article. This helped me out so much, thanks!